A trust is an alternate method of vesting title to real property. In a trust arrangement, a settlor transfers property to another (the trustee), who administers the trust for the benefit of a third (the beneficiary). These roles may be combined in a single individual, except as noted below. Trusts that take effect during a settlor's lifetime are called living (inter vivos) trusts, and trusts that take effect upon a settlor's death pursuant to the terms of a will are called testamentary trusts. In Vermont, a valid trust is created when a settlor has a capacity to create a trust and indicates the intention to do so; the trust has a definite beneficiary and the terms of the trust are for the benefit of said beneficiary; the trustee has duties to perform; and the same person is not both the sole trustee and sole beneficiary of the trust (14A V.S.A. 4-402). Further, the trust's purposes must be lawful and possible to achieve (14A V.S.A. 4-404). A living trust is an estate planning tool that benefits a settlor during his lifetime, and allows the settlor to specify how the trust's assets are to be administered and for the benefit of whom upon his death. 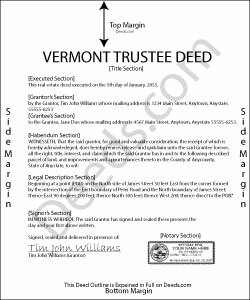 In addition to statute, a Vermont living trust is governed by the terms established by the settlor in the trust instrument. This document is generally unrecorded so as to maintain the confidentiality of the estate plan. The instrument provides a scope of the trust and identifies the trustee and the successor trustee, designates the trust beneficiaries, and enumerates the trustee's powers, among other provisions. Real property is transferred into a living trust by execution of a deed, which vests the subject property in the name of the trustee. In order to transfer the property out of the trust, the trustee, who retains legal title to the property, must execute a deed, referred to as a "Conveyance by Trustee of a Non-Probate Trust" by the Vermont Title Standards. A deed conveying interest in real property into or out of trust "may be any form of deed" . Typically, deeds out of a living trust are descriptively named "trustee's deeds," not to be confused with a trustee's deed pursuant to a sale of foreclosed property under a deed of trust. Trustee's deeds may vary in the level of warranty the grantor intends to offer with the transfer, though the most common level of warranty issued in a trustee's deed is a limited warranty. In Vermont, a limited warranty deed contains the explicit covenants only that the grantor has done nothing to encumber the property, and that the grantor will warrant and defend the title against the lawful claims of persons arising under, by, or through the grantor; in other words, the grantor "takes no responsibility for the state of the title prior to the time the grantor acquired the title". All conveyances must meet the requirements of form and content for instruments pertaining to real property in Vermont. A trustee's deed is signed by each executing trustee in the presence of a notary public before recording at the municipal level in the appropriate clerk's office. Consult a lawyer who can address your specific situation when preparing a Vermont trustee's deed.